On the one hand, I miss the fluff of the first two novels in this series. It used to be that it’d just be a recap of the season, with a plot that loosely ties together different episodes. But, starting in the third book, these took on a life of their own, and in this one there was very little about the season that I recognized. I wonder if that’s because there isn’t much to work with, or because the story in the books is so far removed from the story on the show that it really is its own animal now. That isn’t to say that I didn’t like it: I did. 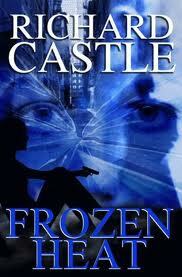 But much like seasons 3 and 4 of Castle, the books have become more serious, and I can’t help but miss the fluff. It’s been 10 years since her mother’s murder, and although Nikki Heat has moved on, she hasn’t forgotten. So, when a woman shows up dead in a meat truck, shoved inside Nikki’s mother’s suitcase, she realizes that she has her first lead on her mother’s case in a long, long time. She digs in, and comes across firewalls — in her precinct, in her personal life, in the secrets she’s digging up — and is thwarted on every turn by the dead bodies that keep piling up. Of course, her lover and sometimes partner, journalist Jameson Rook, is there to help sort out the puzzle pieces, whisk her off to Paris (for research! And for a RTWOTC — Romantic Trip While On The Case), and to be emotional support when things get too much for the stoic Nikki Heat. Hubby asked me when I finished how this held up as a mystery. Honestly, I’m not sure. I’m not well-versed enough in the genre to tell if this was a good mystery, or if it was just a by-the-numbers one. But, I was entertained, it did keep me reading, and I didn’t figure out the twist ending (though, to tell the truth, I wasn’t working that hard, either.) But, since it’s so far removed from the show at this point and has resolved things that the show has left hanging, I’m curious to see what the writer(s) of this one come up for next year’s book. Wait–they made the TV show into books? That's hilarious. Now I'll have to read book 1.